Babor Advanced Biogen Day Cream is chalked full of active ingredients such as evening primrose oil, hyaluronic acid, macadamia nut oil, panthenol, and vitamin E.
Evening primrose oil is such a natural ingredient and a good one at that. It has numerous benefits and rarely any side effects. Primrose oil is excellent for sensitive skin, rejuvenated the skin, has anti aging properties, decreases wrinkles, hydrates rough skin, and reduces blemishes and redness. I love that Babor's Biogen day cream has evening primrose oil in it. The next "natural" ingredient is hyaluronic acid. Hyaluronic acid is the latest skin care craze! It actually encourages the formation of collagen. This is wonderful for those of us who want to keep our elasticity in our skin. Macadamia nut oil has been coined as the "vanishing oil." it penetrates the skin very quickly to tone and heal dry skin. In fact, in France this specific nut oil is used to prevent sunburn. So, needless to say, the Babor Advanced Biogen Day Cream has some wonderful ingredients in it. Another thing to consider is the SPF protection that is in this day cream. Why should you have to apply both a sunscreen and a day cream. That combination does not help with trying to prevent acne. 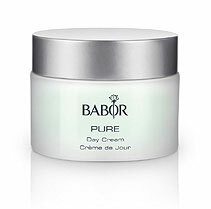 Cleanse and apply babor advance biogen day cream liberally to face area. Water (aqua), Glycine Soja (soybean) Oil, Cetearyl Alcohol, Cetearyl Ethylhexanoate, Butylene Glycol, Macadamia Termifolia Seed Oil, Steareth-2, Steareth-21, Glycerin, Tocopheryl Acetate, Porphyra Umbilicalis Extract, Cucurbita Pepo (pumpkin) Extract, Mimosa Tenuiflora Bark Extract, Oenothera Biennis (evening Primrose) Oil, Panthenol, Retinyl Palmitate, Ascorbyl Palmitate, Lecithin, Sodium Hyaluronate, Tocopherol, Pantolactone, Ascorbic Acid, Propylene Glycol, Dimethicone, Fragrance (parfum), Isopropyl Myristate, Sodium Cetearyl Sulfate, Caprylic/capric Tyiglyceride, Xantham Gum, Sodium Hydroxide, Citric Acid, Sodium Lactate, Alcohol, Phenoxyethanol, Methylparaben, Ethylparaben, Propylparaben Butylparaben, Isobutylparaben, Sodium Benzoate, Sorbic Acid, Potassium Sorbate. "Works miracles for super dry skin, it immediately smoothed out my flaking dry uneven skin." "At first it felt a little bit like glue, but it sunk into my skin and works wonders for my extremely dry skin." "It was too much oil for my already oily skin."